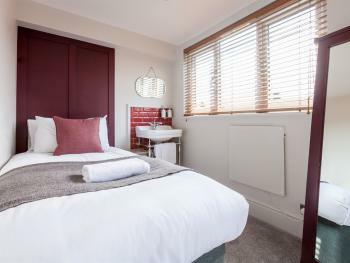 Our 4 double en-suite rooms all have a comfortable double bed with duck and down feather duvets and pillows. 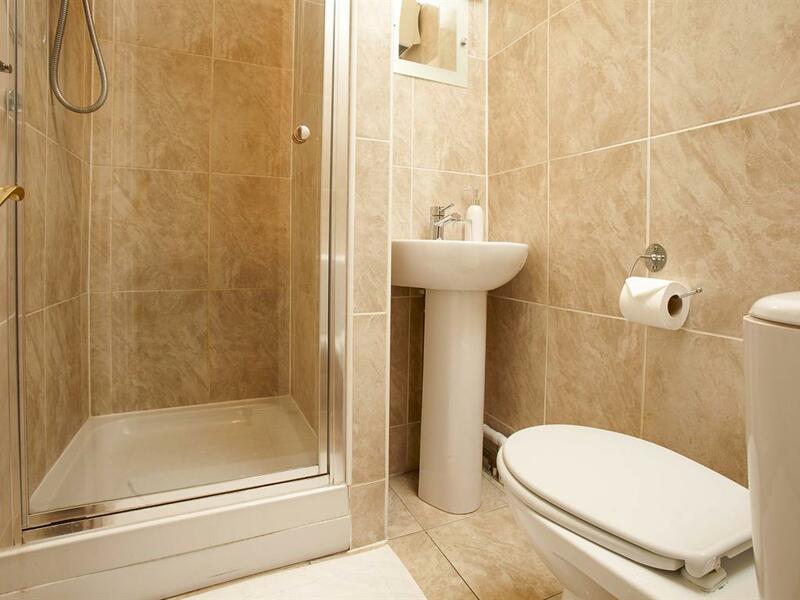 The brand new en-suite bathroom contains a shower, hand basin and toilet. 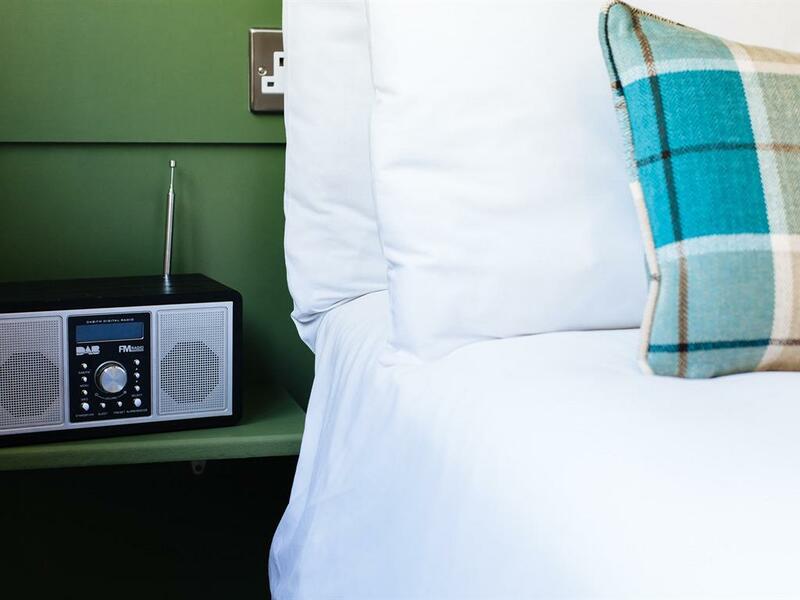 Each room has a flat screen TV, DAB radio, hair dryer and free Wi-Fi access and tea and coffee making facilities. An iron is available to use in our breakfast room. Our light and airy rooms have a tasteful décor, some rooms have balconies and some have park views. A continental breakfast is included in the price and is served in the morning from 8:00 - 9:30 on weekdays and 9:00 - 10:30 weekends. Check in time is at 14:30 and check out time is 11:30. If you wish to check in or out later than the times stated then please contact us and we will endeavour to accommodate your request. Our double room over looks the park with a desk in the window where you can work while watching the world go by. 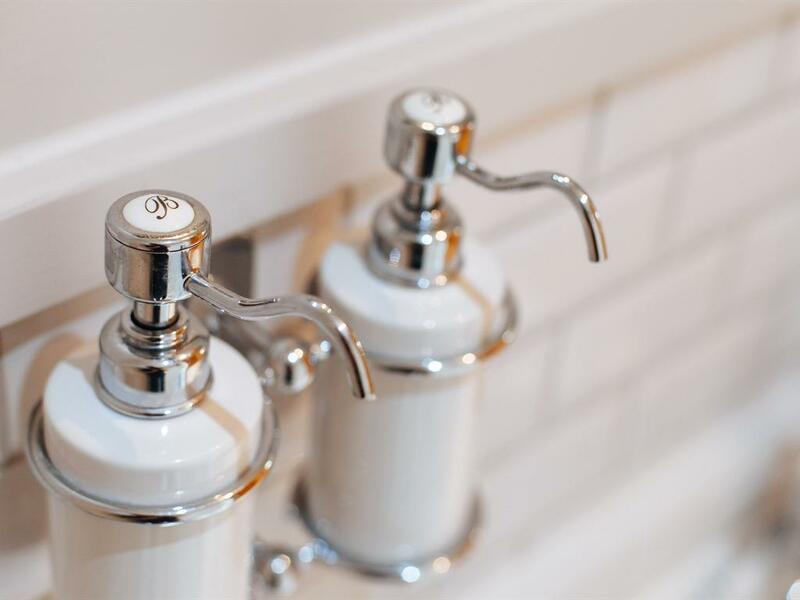 The room does not have it's own private bathroom so it is our largest and most spacious room at regency House, although there is no bathroom where is a vanity unit/sink within. 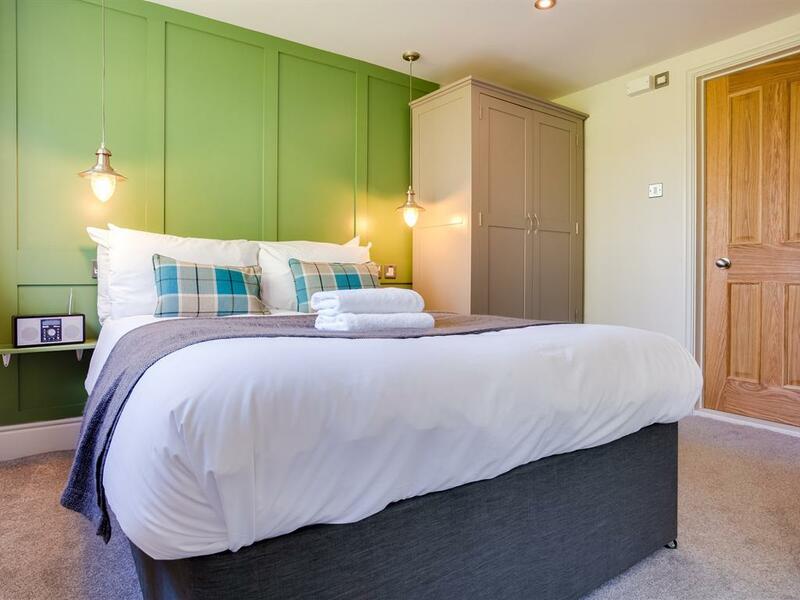 A comfortable double bed with duck and down feather duvets and pillows. A flat screen TV, DAB radio, hair dryer and free Wi-Fi access and tea and coffee making facilities. An iron is available to use in our breakfast room. A continental breakfast is included in the price and is served in the morning from 8:00 - 9:30 on weekdays and 9:00 - 10:30 weekends. Check in time is at 14:30 and check out time is 11:30. If you wish to check in or out later than the times stated then please contact us and we will endeavour to accommodate your request. Our triple/family room over looks the park with two large sash windows to let in light. 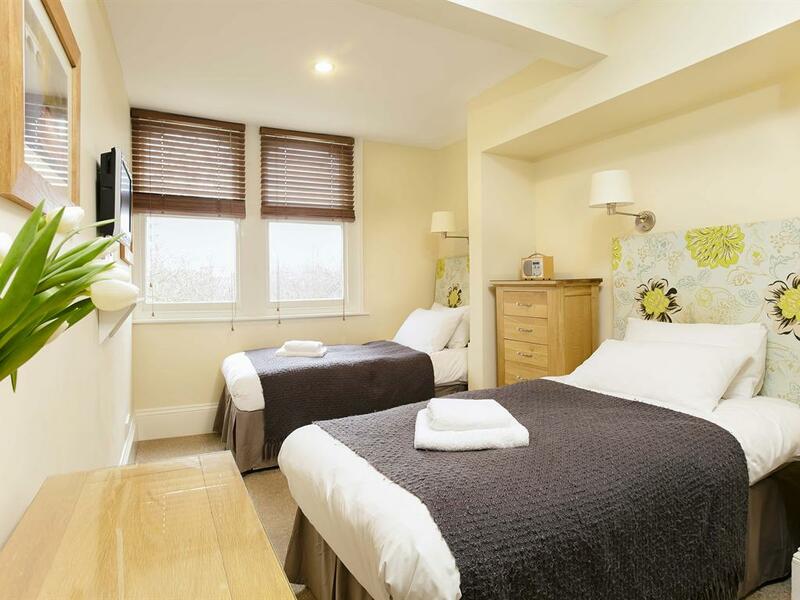 There is a double bed and day bed, this room would be set up for a couple, friends or a family. The room does not have it's own private bathroom but there is a bathroom next door and a vanity unit/sink within the room. Comfortable beds with duck and down feather duvets and pillows. A flat screen TV, DAB radio, hair dryer and free Wi-Fi access and tea and coffee making facilities. An iron is available to use in our breakfast room. A continental breakfast is included in the price and is served in the morning from 8:00 - 9:30 on weekdays and 9:00 - 10:30 weekends. Check in time is at 14:30 and check out time is 11:30. If you wish to check in or out later than the times stated then please contact us and we will endeavour to accommodate your request. 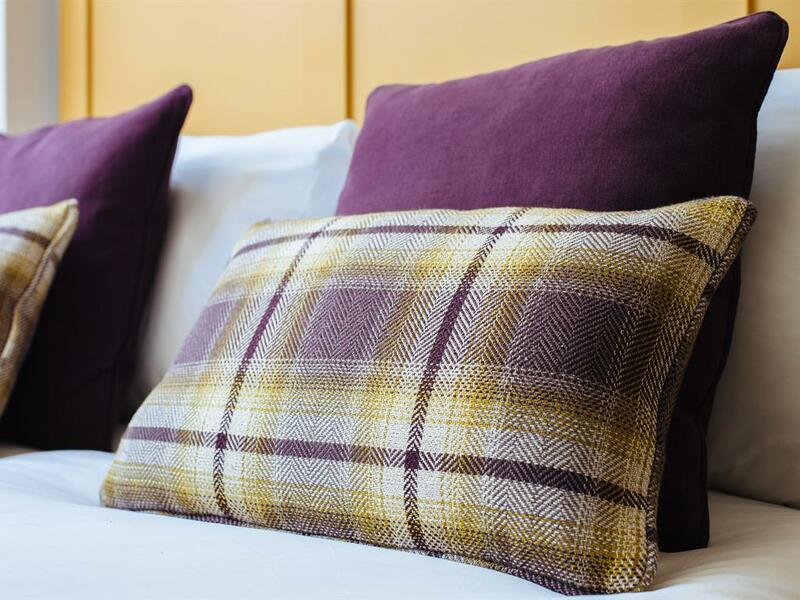 Our 4 single rooms all have a comfortable beds with duck and down feather duvets and pillows. use of new bathrooms containing a shower, hand basin and toilet. 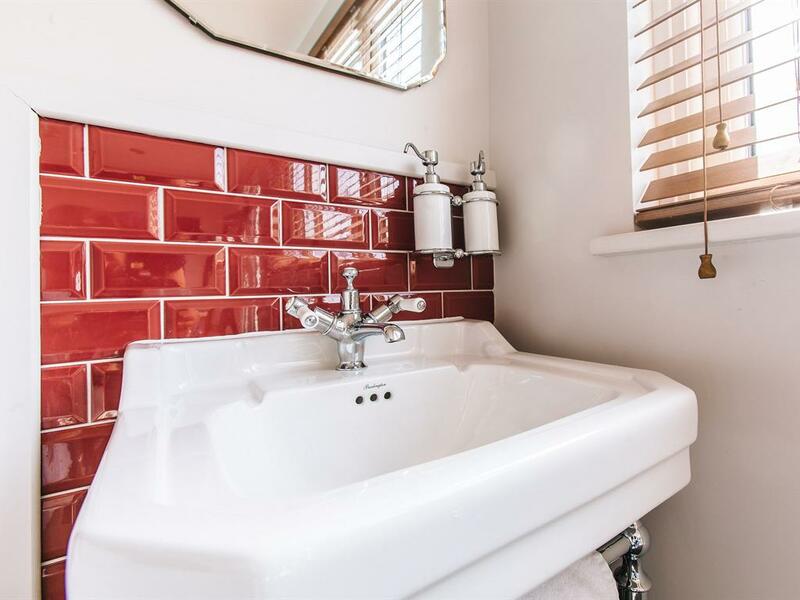 Within the room is a vanity unit/sink. Each room has a flat screen TV, DAB radio, hair dryer and free Wi-Fi access and tea and coffee making facilities. An iron is available to use in our breakfast room. Our light and airy rooms have a tasteful décor, some rooms have balconies and some have park views. A continental breakfast is included in the price and is served in the morning from 8:00 - 9:30 on weekdays and 9:00 - 10:30 weekends. Check in time is at 14:30 and check out time is 11:30. If you wish to check in or out later than the times stated then please contact us and we will endeavour to accommodate your request. 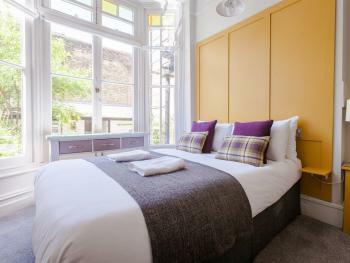 Our double room has direct access to the enclosed courtyard garden, a comfortable double bed with duck and down feather duvets and pillows. A flat screen TV, DAB radio, hair dryer and free Wi-Fi access to a brand new shower room located next door and shared with one other room. An iron is available to use in our breakfast room. 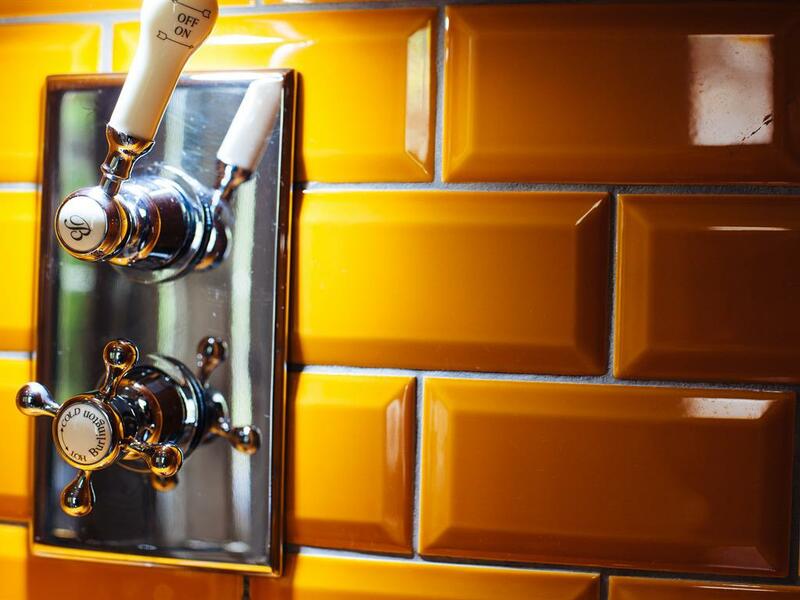 Laundry and cooking facilities are available to use in the new and fully equipped shared kitchen. Important information Free public parking is possible at a location nearby reservation is needed. Please note that parking spaces are limited, subject to availability and by prior arrangement. 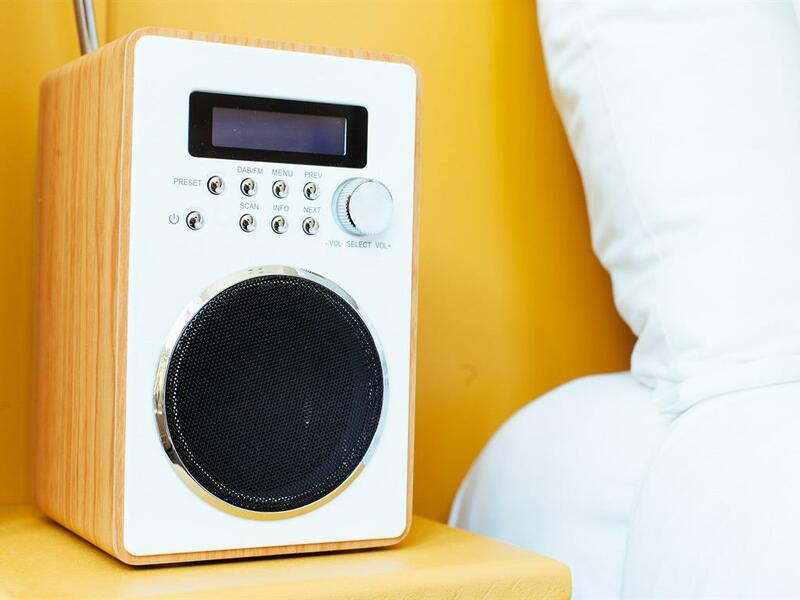 You can use the Special Requests box when booking, or contact the property directly using the contact details provided in your confirmation. Please note that the building is a Victorian Townhouse with stairs and no lift. This is not suitable for people with limited mobility, as the hotel is spread across 5 floors. Guests should kindly note that the property has a digital lock on the front door, allowing guests to check-in during times when a staff member is not present. This information is emailed to the guest at the time their payment is taken in a second e-mail and provides the necessary information for opening the digital lock. Regency House may not be suitable for guests with disabilities or mobility issues, due to the rooms being spread out over 5 floors. Regency House does not have a night porter to assist guests with disabilities or mobility issues. Guests must be able to evacuate themselves in an emergency. There are no vibrating pads or visual alarms at this property to alert guests with disabilities in the event of fire. A continental breakfast is included in the price of some rate plans and is served in the morning from 7:30 - 9:30 on weekdays and 8:30 - 10:30 weekends. Check in time is at 14:30 and check out time is 11:30. 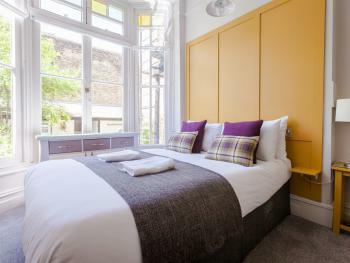 Our twin room has a comfortable two single beds with duck and down feather duvets and pillows. A flat screen TV, DAB radio, hair dryer and free Wi-Fi access to a brand new shower room located next door and shared with one other room. An iron is available to use in our breakfast room. Laundry and cooking facilities are available to use in the new and fully equipped shared kitchen. Important information Free public parking is possible at a location nearby reservation is needed. Please note that parking spaces are limited, subject to availability and by prior arrangement. You can use the Special Requests box when booking, or contact the property directly using the contact details provided in your confirmation. Please note that the building is a Victorian Townhouse with stairs and no lift. This is not suitable for people with limited mobility, as the hotel is spread across 5 floors. Guests should kindly note that the property has a digital lock on the front door, allowing guests to check-in during times when a staff member is not present. This information is emailed to the guest at the time their payment is taken in a second e-mail and provides the necessary information for opening the digital lock. Regency House may not be suitable for guests with disabilities or mobility issues, due to the rooms being spread out over 5 floors. Regency House does not have a night porter to assist guests with disabilities or mobility issues. Guests must be able to evacuate themselves in an emergency. There are no vibrating pads or visual alarms at this property to alert guests with disabilities in the event of fire. A continental breakfast is included in the price of some rate plans and is served in the morning from 7:30 - 9:30 on weekdays and 8:30 - 10:30 weekends. Check in time is at 14:30 and check out time is 11:30. Our 3 double bedrooms with private bathrooms and use of a shared kitchen all have modern furnishings, a comfortable double bed with duck and down feather duvets and pillows. 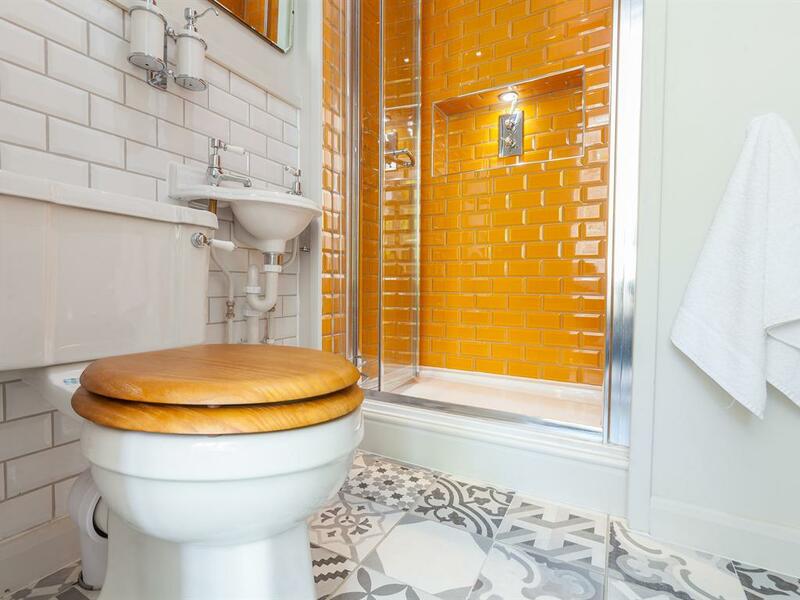 The brand new private bathroom is located next door to the room and contains a shower, hand basin and toilet. Each room has a flat screen TV, DAB radio, hair dryer and free Wi-Fi access and laundry and cooking facilities are available to use in the new and fully equipped shared kitchen. Our light and airy rooms have a tasteful décor and park views. Important information Free public parking is possible at a location nearby reservation is needed. Please note that parking spaces are limited, subject to availability and by prior arrangement. You can use the Special Requests box when booking, or contact the property directly using the contact details provided in your confirmation. Please note that the building is a Victorian Townhouse with stairs and no lift. This is not suitable for people with limited mobility, as the hotel is spread across 5 floors. Guests should kindly note that the property has a digital lock on the front door, allowing guests to check-in during times when a staff member is not present. This information is emailed to the guest at the time their payment is taken in a second e-mail and provides the necessary information for opening the digital lock. Regency House may not be suitable for guests with disabilities or mobility issues, due to the rooms being spread out over 5 floors. Regency House does not have a night porter to assist guests with disabilities or mobility issues. Guests must be able to evacuate themselves in an emergency. There are no vibrating pads or visual alarms at this property to alert guests with disabilities in the event of fire. A continental breakfast is included in the price of some rate plans and is served in the morning from 7:30 - 9:30 on weekdays and 8:30 - 10:30 weekends. Check in time is at 14:30 and check out time is 11:30. Our double bed apartment occupies the first floor enjoys a park view from the bedroom/living room. Within this light and airy room you will find a comfortable double bed with duck and down feather duvets and pillows. 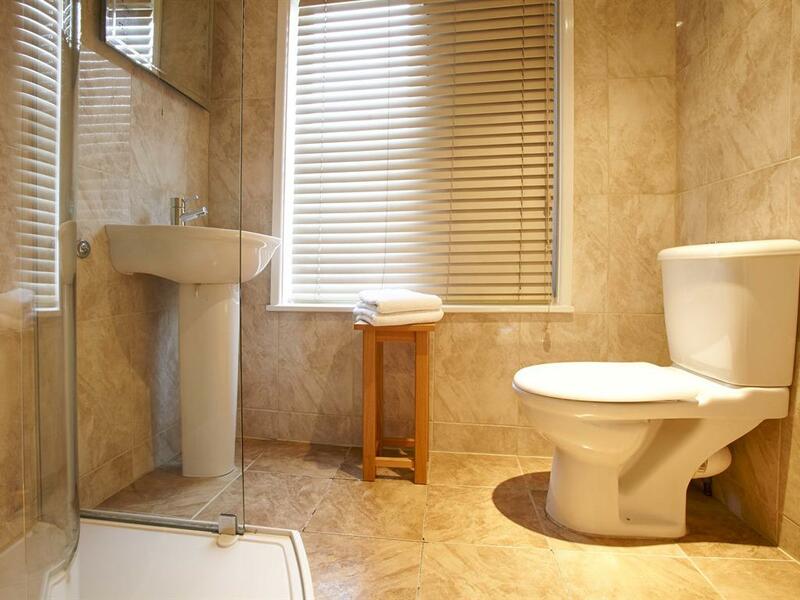 The brand new private bathroom is located next door to the room and contains a shower, hand basin and toilet. The apartment has a sofa, desk, flat screen TV, DAB radio, hair dryer and free Wi-Fi access and laundry and cooking facilities are available to use in the new and fully equipped kitchen. Important information Free public parking is possible at a location nearby reservation is needed. Please note that parking spaces are limited, subject to availability and by prior arrangement. You can use the Special Requests box when booking, or contact the property directly using the contact details provided in your confirmation. Please note that the building is a Victorian Townhouse with stairs and no lift. This is not suitable for people with limited mobility, as the hotel is spread across 5 floors. Guests should kindly note that the property has a digital lock on the front door, allowing guests to check-in during times when a staff member is not present. This information is emailed to the guest at the time their payment is taken in a second e-mail and provides the necessary information for opening the digital lock. Regency House may not be suitable for guests with disabilities or mobility issues, due to the rooms being spread out over 5 floors. Regency House does not have a night porter to assist guests with disabilities or mobility issues. Guests must be able to evacuate themselves in an emergency. There are no vibrating pads or visual alarms at this property to alert guests with disabilities in the event of fire. A continental breakfast is included in the price of some rate plans and is served in the morning from 7:30 - 9:30 on weekdays and 8:30 - 10:30 weekends. Check in time is at 14:30 and check out time is 11:30. Friendly and personable staff. Wonderful breakfast with something for every taste. Room, bed, linen all clean and I felt very cared for.